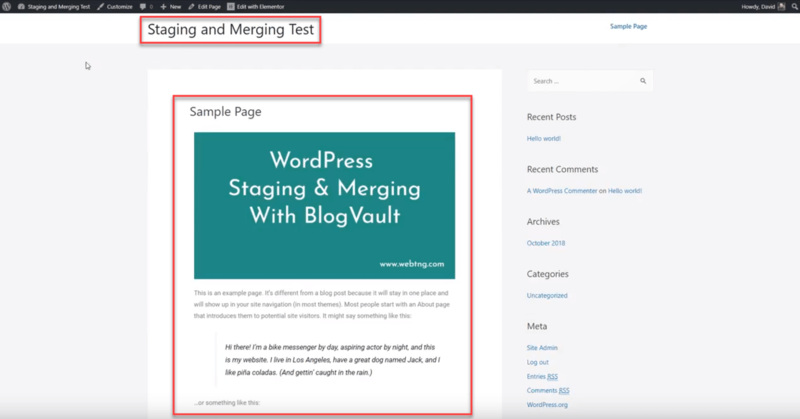 In this article I want to look at WordPress staging and merging using BlogVault. 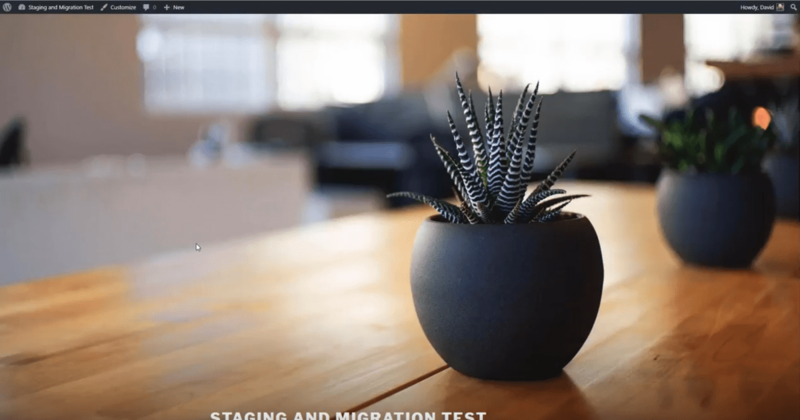 Staging is important in the process of developing websites. 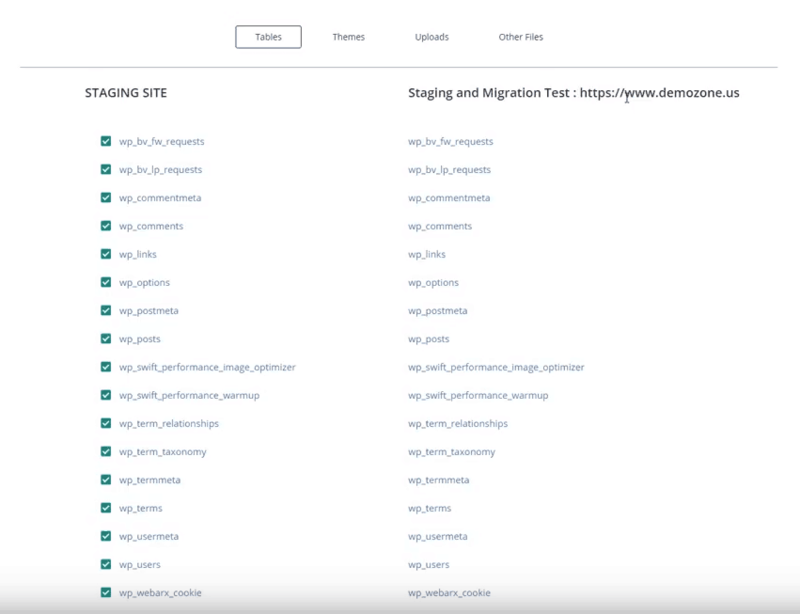 It allows a developer to make changes without putting the production site in jeopardy and without interrupting service, but if you’re making changes on a staging site while the production site is still active, what happens if visitors to your site leave comments, upload files, become members, or if it’s an e-commerce site with purchases? When you bring your changes from staging back to production you have to carefully merge in your changes so that you don’t lose any of the important activity that happened during development. 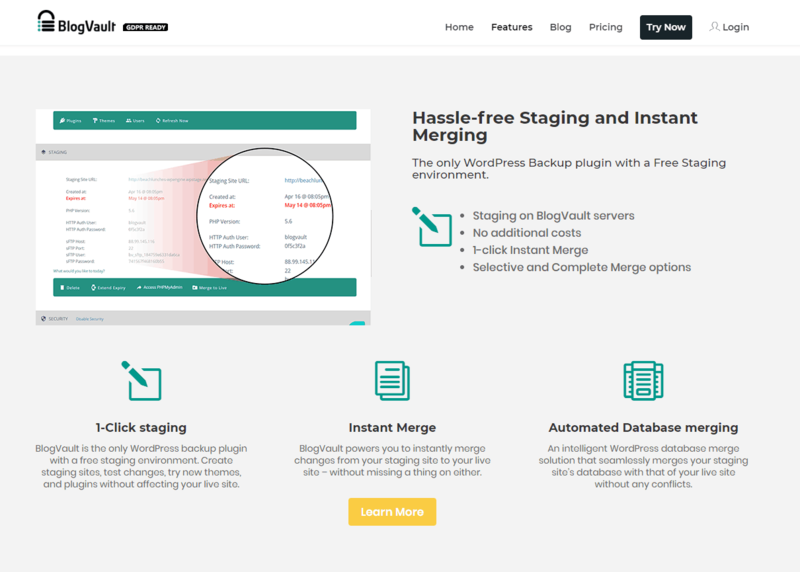 I knew that BlogVault offered a staging site if you’re using their backup service, but recently I noticed that they also offer “merging.” On the BlogVault features page they list merging. I had the thought to just try it out and see what happens. This is going to be a rather unsophisticated quick test, I’ve not done this before, and I had absolutely no idea how it’s going to work out. Let’s give it a try. I have a site I use for testing. 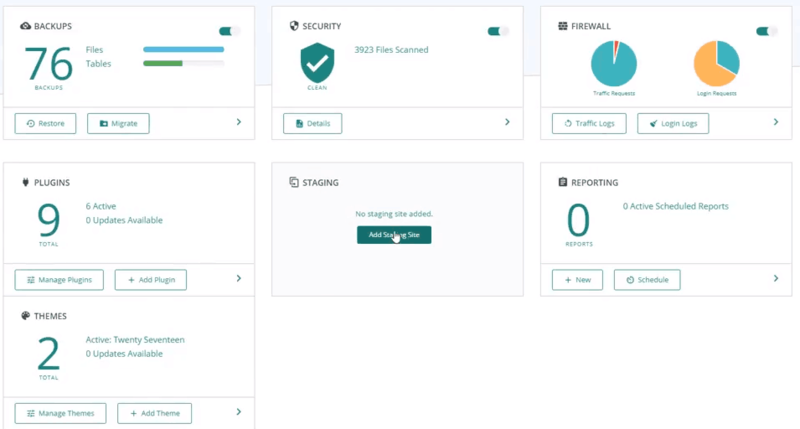 It’s hosted on Cloudways. I reset it back to default. I’ve got the Twenty Seventeen Theme enabled. If we go and look at the dashboard, at the plugins, I have Elementor and Elementor Pro. I’ve got ManageWP, which is how I keep the site up to date. There’s the database reset plugin. I also have MalCare Pro installed. MalCare and BlogVault are two sister companies and apparently the plugins are the same, but it gets branded as MalCare if you install that first or BlogVault if you install that first. Go figure. I’ve disabled the caching plug-in and I’ve disabled the WebArx’s Firewall. I disabled these so we won’t wonder if something else is playing a role if something goes wrong. I also disabled the mail SMTP plugin because I don’t foresee sending mail during this test. So here is the BlogVault dashboard. I’m going to add a staging site. The first thing we see is that the times of the backups are in GMT but I select the the most recent one. It took close to five minutes to create the staging site. When it has completed it shows the username, password and a link. I log in and everything looks just like the live site. One thing I noticed is we have a domain mismatch on our Elementor Pro license. I could reactivate it on the correct domain but we’ll just let that stay as we’re going to be quick. What I want to do is make some changes. 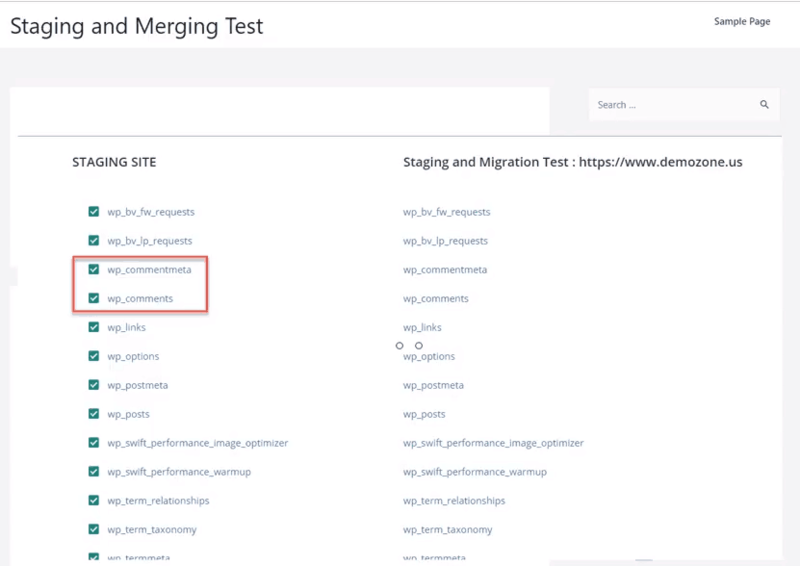 The site title is called “Staging And Migration Test,” but it’s actually “Staging and Merging Tests,” I change the name of the site. Now let’s go to the Sample Page and edit it with Elementor. I add an image and moved it above the text. So we have the Sample Page now edited with Elementor. We’ll see if that goes over to the production site. Next I change the theme and install Astra. Now, I want to go back to the production site, which is still on the 2017 Theme. I leave a comment on the production site. Back at the BlogVault dashboard, I start the merge. We’re are shown a page with several tabs. There is a list of the database tables, a tab showing the themes differences and one showing the plugin differences. On the database tab, it would be nice if it showed there was a conflict. We know there is a conflict as there was a comment entered on the production site. There’s no option to look at database conflicts, so we’ll just have to hope it does the right thing. When we are ready to merge BlogVault asks for my server details for SFTP. Then I’m prompted to select the folder where the root of site is, and it’s done. Looking at the site, it’s got the Astra theme, the site name has changed, we have the page editing with Elementor. However, our comment that we entered on production was overwritten. We lost our comment, so when we were on the screen where it lists the database tables we would have had to un-check the comments tables to avoid overriding those. If this was our own site, it wasn’t too busy, and comments were the only thing entered on the production site, then you could manually do that and un-check those tables. However, if you had a very active site that might not be practical. 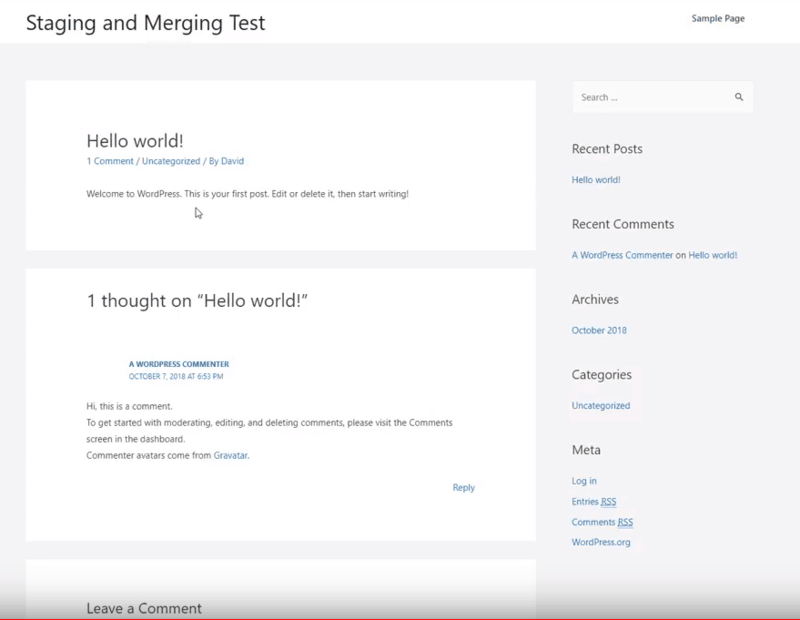 What this tells me is that the BlogVault staging feature is very functional, but the merging feature is limited.